From the perspective of Shara Gamble, marketing manager for TAMKO’s Envision line of decking products, today’s palette of colors is more than broad enough to help solve some of the indooroutdoor transition needs of clients seeking to visually merge indoor and outdoor living spaces. 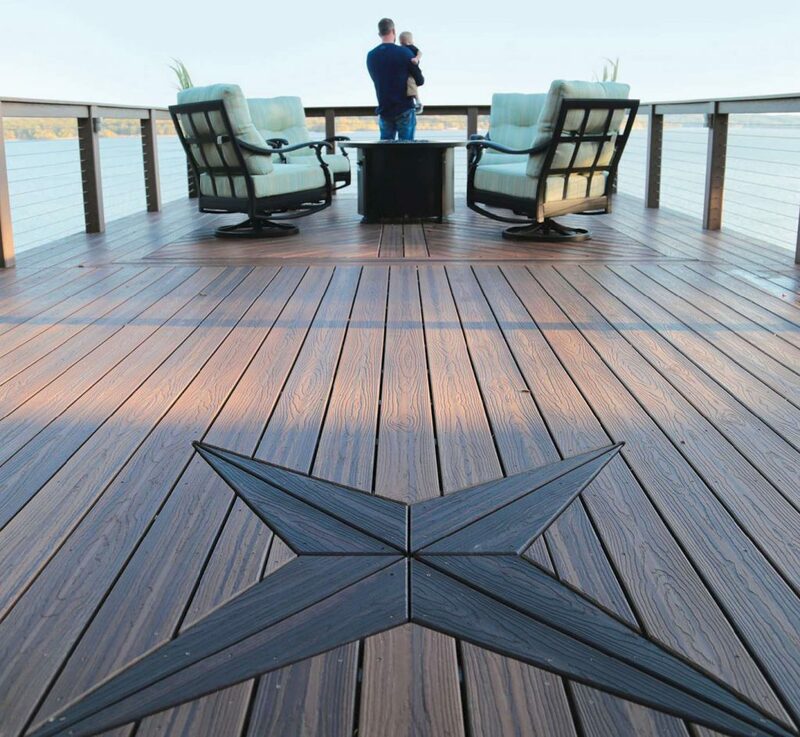 After spending months listening closely to their customers—both deck builders and remodelers— the real need is how best to meet the homeowners’ desired personalized touches for their deck design. If the main area of a deck is one color, the homeowner may want a different color on a different level. “It’s the same as we are seeing with designers of indoor spaces. You want to have an accent to pull in a color and match your personal style,” Gamble explains. Many companies spoke of the trend toward picture framing of decks, outlining them with a darker accent color. To that end, Deckorators has come out with a 21-foot board expressly for that purpose. The extra foot of length in the board is to account for 45-degree corner cuts that are necessary within the process of picture framing. The surface temperature and texture of boards is also an important point of reference in today’s expanding offering of deck boards. Deckorators’ Camfferman extolled the no-slip virtues of some its more deeply embossed products, which have been intentionally designed to alleviate homeowner concerns about slips on wet plastic surfaces. Matte finishes were cited by many as being another point of differentiation within certain deck designs that might also include glossier finishes. Two years ago, MoistureShield put a stake in the ground on the issue of hot deck board temperatures— perhaps too hot to step on with bare feet. The company introduced it’s CoolDeck technology, a formulation that absorbs less heat from the sun. In 2019, new decks will be one of the highest demanded types of remodeling projects. They will be built on rooftops, on hillsides stepping down to patios, and they will be merged and integrated onto the rear interior living rooms of homes more seamlessly than ever before. This will be the result of new darker and richer colors, including dark grays, to better match interior flooring and accents. But perhaps most importantly, alternative decking material is taking on all categories of wood decking products, hoping to eat away at the massive 83 percent share wood currently enjoys. Click the button below to view the article. Creating the perfect entertainment space is easy when you have a beautiful composite deck from Envision®. Learn more details in today’s Envision® blog. TAMKO Envision updated their profile picture. Envision® Registered Contractors must periodically meet certain qualifications to become or remain an Envision® Registered Contractor; however, TAMKO does not make any representations or warranties regarding the reputation, skill level, qualifications or expertise of Envision® Registered Contractors. Envision® Registered Contractors are not employees of, agents of, or affiliated with TAMKO in any manner.